Thank you for your financial support. As a 501(c)(3), all contributions are tax deductible. an organization that rates nonprofits. Every gift makes a difference. $20 could help print a workbook, $50 would provide a student with a certificate of completion, and $100 could be a donation to our scholarship fund. We would love to be a charity that you support all year long. 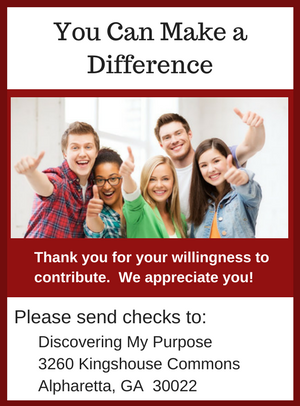 Monthly donors receive special communications about our efforts and recognition on our donor web page. 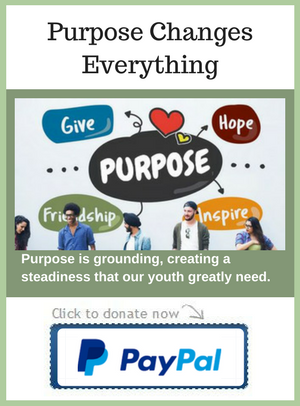 Donate $249 and Discovering My Purpose will use this money to provide programming to a student in need. Student sponsors receive thanks and recognition on our donor web page. Donate $995 and provide a school, club or place of worship with all the required programming and resources to teach up to 20 students. Class sponsors receive special communications about our efforts, recognition on our donor web page, and their name printed on the cover of the sponsored class's student workbooks.